After receiving a worrying phone call from your mom, you return to your hometown of Lightfalls to investigate. But things aren't quite as you remembered them a strange device has risen from the nearby lake, and it's causing the people of Lightfalls to disappear! A boy from your childhood seems to be behind it all, but can you stop his evil scheme before it's too late? 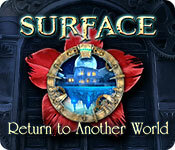 Journey to the magical world beneath the lake and save your family in this exciting Hidden Object Puzzle Adventure!